Help for impaired motor coordination! 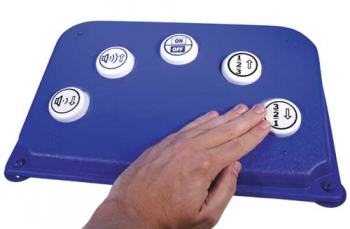 Our oversized TV remote control is perfect for viewers with impaired motor coordination. The wireless remote features a large striking area with 2" push buttons. The buttons are clearly labeled with words and symbols for Channel, Sound and On/Off functions. Uses infrared technology compatible with most remote-controlled TV’s. Five input jacks allow you to control the remotes with any of our external capability switches (not included). Size: 15½"L x 10½"W x 3"H.
Note: Cannot be used with TV/VCR or TV/DVD combination units. Please Note: The user’s guide posted here is for current models only, if you have an older remote module please contact us.